Beech trees are comfortable. Smooth gray bark with sweeping sloped crotches, beech gifts the climber with branches near enough for easy assent and spaced far enough to allow access to all areas of the tree without too much rope tangling. The canopy is graceful, spreading as much as fifty feet. Taxonomically related to oaks, the wood is strong and reliable with plenty of convenient nooks for a contented coffee break. I love beech trees. In the eighties Jimmy and I formed a symbiotic partnership that lasted almost a decade. We were the proverbial weekend two guys in a pickup truck (actually two pickup trucks). He was a high school biology teacher who saved his money, bought a small clapped out, now thriving, nursery and landscaping operation and today owns a successful business, even hosting for years his own landscaping advice Saturday radio show that is widely respected in Boston. Both of us were trying to support our dreams (and in my case parochial school tuitions). I was the tree climber; he ran the ropes and chainsaw on the ground. Both of us cleaned up the mess. Occasionally, we would take on projects far beyond the scope for which we were equipped. Jimmy and I were nothing if not confident in our ability to overcome. One such job was taking down an old, weakened and dangerous beech tree on the estate Jimmy lived on as part time groundskeeper. Forty five or more inches diameter at the ground, it extended upwards at least eighty feet. We had room to drop it, but to control the fall I climbed it to put in a pull line at sixty feet or so. About twenty feet up, the trunk branched into two main leaders. As I climbed past that divergence, I heard a low familiar hum and looked down into a mass of honey bees nestled in the crotch. The bees and I attentively ignored one another. When I descended after setting the pull line, we huddled and came up with a contingency plan. Clearly, when the tree hit the ground, a nest of undetermined size would be broken open and discharge an army of protective, seriously overwrought, stinging insects. We warned off weekend picnickers and Frisbee throwers; the estate was open to the townspeople and lovely. Jimmy hooked up the pull line to the pickup truck, putting tension on it well clear of the fall zone, and I began to cut the notch about two feet off the ground. The cutting stopped abruptly when sparks erupted and we discovered the center of the tree had been filled with cement many years earlier to try and treat a cavity. The hits just kept on coming. We regrouped at Jimmy’s tool box and pulled out a three pound hammer and cold chisel. Making the cut took well over an hour, normally a ten minute job. A little careful chain sawing, resharpen the teeth, some hammer and chisel work – eventually the tree was sufficiently notched to start the back cut, which involved the same arrangement of chain saw, chisel and chain file. As the tree started its rapidly accelerating fall, I ran like my life depended on it to the truck and jumped in the cab. The beech hit the ground with a crash, splitting open longitudinally and tearing apart an awe inspiring bee’s nest over fifteen feet long. Almost immediately the windshield and side windows of the truck were covered in bees so thick we couldn’t see out. We waited, tethered to the top of the tree with no place to go and told stories. Eventually, we had to kill the bees that night when they settled down, after we consulted with a local bee keeper, who assured us we would never be able to find the queen and relocate the nest. We didn’t want to spoil all that honey with pesticide, but the exposed nest could not be left with all the children who played in the fields nearby. We cut the tree into firewood by our headlights late into the night and hauled the brush to the estate’s mulch pile. Current arboricultural practice avoids the cement filled cavity because it seals in the rot and creates a fulcrum further weakening the tree against future storms. Other common practices of my youth are no longer espoused by those who understand the nature of trees. At one time, we carried screw top paint pots, ruining our clothes as we painted all cuts over three inches to protect the tree. What the paint really did was kill back the cambium, that single layer of growth cells that produce bark on the outside and vessels to transport nutrients on the inside. Cambium is how the tree grows in girth and how it heals from injury. The paint slowed healing, and the protection it afforded against rotting fungus spores broke down long before the wound healed over. A third abandoned common wisdom relates to how young trees were planted. Routinely we would stake them with wire and hose to keep them from blowing over and fill the hole in which we planted them with rich nutrients and peat moss. Stakes are now left in place only a very short period, if at all, and the heavy nutrients are now generally left out. As knowledge of tree development and physiology has evolved, we’ve learned staking prevents much of the normal swaying in the wind that stimulates long term root growth, which more permanently anchors the tree against uprooting in a storm. Over fertilizing saplings promotes excessive root development circumscribed primarily within the original planting pit and depresses root growth out into the indigenous soil that is necessary to nurture the tree for decades. There is an analog, I believe, with people. Over protection and excessive coddling inhibits the testing and development necessary for healthy, long term growth. As our child centered culture awards trophies for participation and social promotion for substandard academic performance, we wrongly cultivate “self esteem” at the expense of self reliance and real confidence fired in the kilns of overcoming difficult circumstances. The truth is rooted in the difficult reality that we are not all equally talented, bright or capable in every aspect of life, but we all have a niche wherein we can contribute and flourish. Culturally, the progressive holds out for equal outcome, not opportunity, to the detriment of long term societal health. Robust individualism slowly putrefies in a culture steeped in collectivism and entitlement, ultimately weakening the whole organism of this great blue ball we inhabit. Individualism is decried as selfish and egocentric, while, I believe it to be our only true course to growth and healing. Jack you bring back fond memories of bee stings and the momentary rush associated with falling a big Beech tree. My own story involves a family of Raccons that were unceremoniously disturbed when their hollwed out home came crashing down w/them inside. Like you I ran as fast as I ever did for cover from said bees and went back after dark and harvested a bunch of honey and honey comb before spraying any of the goods. My wife (city girl) was confident then that she had married well below herself and still tells the story with a special gleam in her eye. She actually checked my life insurance policy (we were newly married less than 6 months) while I was in the act of cutting. 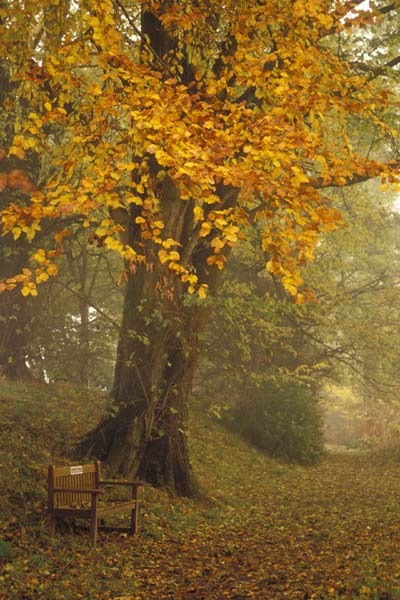 Like you I to have a special fondness for the Beech tree. I believe only you could bring the story of the beech tree, the planting of small tree’s and tree well being and said actions to provide, to an analogy that chides the present administration in the White House……..bravo young man!! By the way……..you guys are certifiable.